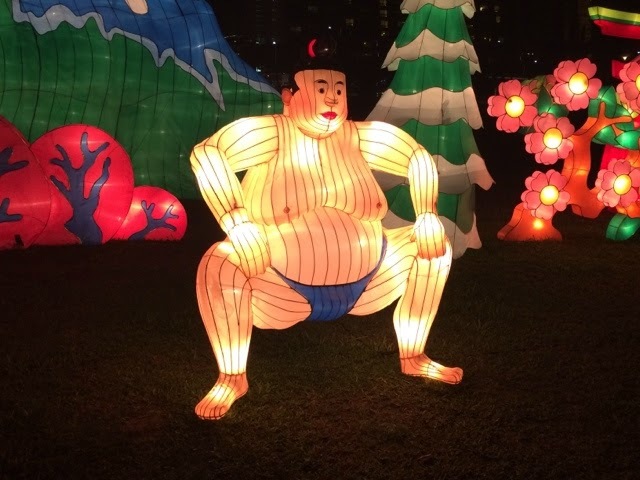 The Mid-Autumn festival is currently being celebrated in Singapore and Gardens by the Bay are putting on an amazing lantern display. I went to the gardens last Friday evening to have a look and I have to say it is better than ever! Just in case you don't know the Mid-Autumn festival is a harvest festival which is held on the 15th day of the eighth month in the Chinese calendar. The festival celebrates gathering (for example family and friends coming together), thanksgiving (giving thanks for the harvest) and praying (asking for conceptual or material satisfaction). The harvest has been celebrated during the autumn full moon since the Shang dynasty (16th to 10th century BC). 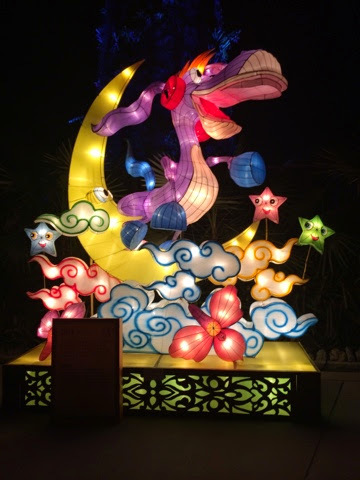 An important part of the festival celebration is moon worship as the ancient Chinese believed in rejuvenation being associated with the moon and water. Offerings were made to a lunar deity known as Chang'e who was the Moon Goddess of Immortality. The festival was a time to celebrate the successful harvesting of rice and wheat with food offerings made in honour of the moon. 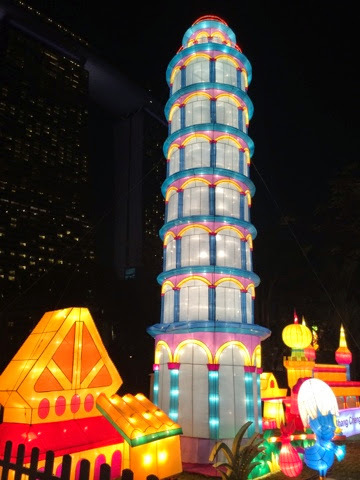 Today people celebrate Mid-Autumn festival and enjoy eating mooncakes, a taste I'm afraid I haven't managed to acquire in my time in Singapore and carry brightly lit lanterns at celebrations. Many people were carrying their own lanterns around with them on Friday night, myself included, whilst enjoying the fabulous displays all around the gardens. 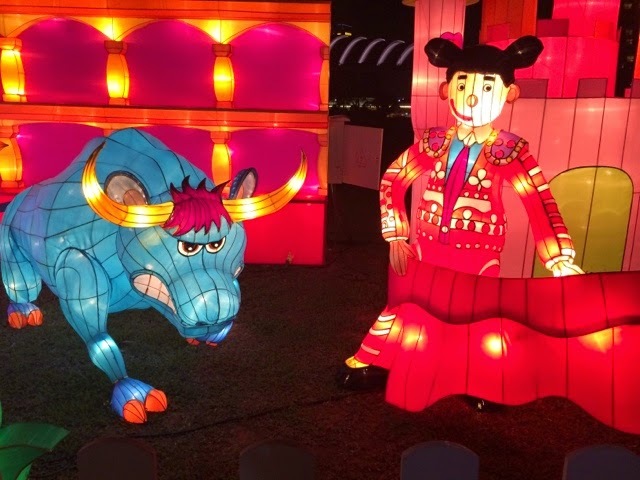 Gardens by the Bay is celebrating the festival with a huge display of lanterns this year featuring both traditional Chinese themes and international themes that everyone will be able to recognise. If you look at my first photos you'll see we were taken on a mini tour around the world and you should be able to identify various different countries, which ones can you recognise? 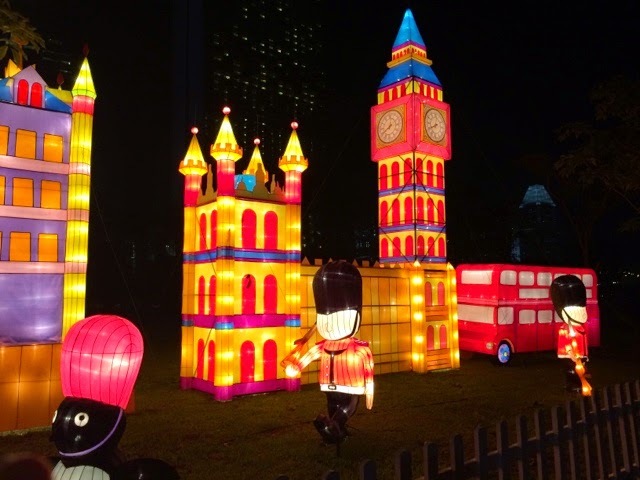 Hopefully you'll notice the UK lanterns with some of London's famous landmarks. The traditional themes include the ancient Chinese palace, the Eight Immortals Crossing the Sea and the Treasure Voyages of Cheng Ho. 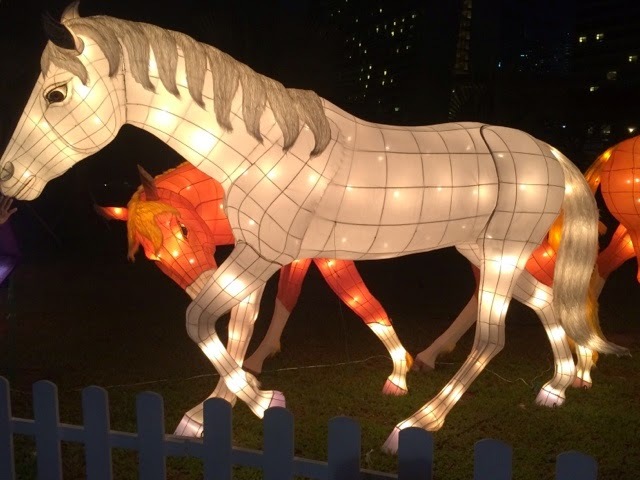 There are lanterns representing all the different races in Singapore under the theme of racial harmony, ones representing the twelve Chinese zodiac signs, a sporting theme and a birds of paradise theme. I thought they were all great but was particularly taken with the ancient Chinese palace and the other large lanterns out in the lake. They all look very magical lit up at night. 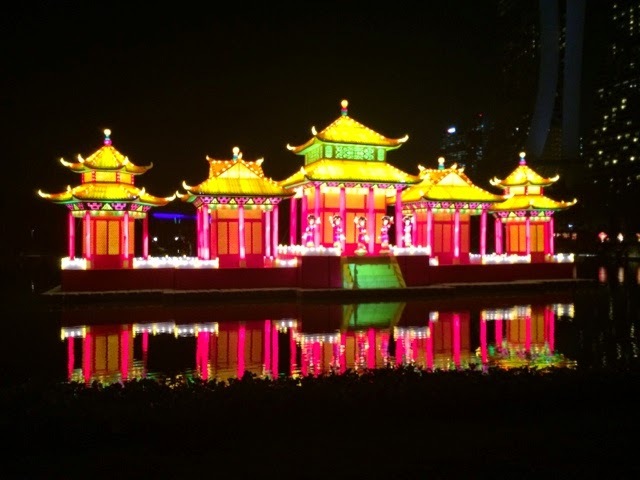 Asides from the lanterns there are plenty of other things to see and do at the festival. 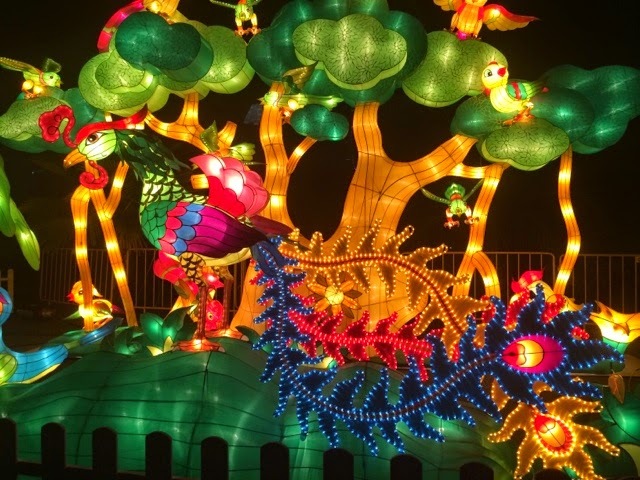 There are nightly cultural performances, various dance and art troupes will be at the gardens as well as a sculpture exhibition at the Silver Garden. For more details of what you can see check out the Gardens by the Bay website. There are also loads of cultural activities for visitors to participate in, plus you can view the winning entries from a lantern making competition too. 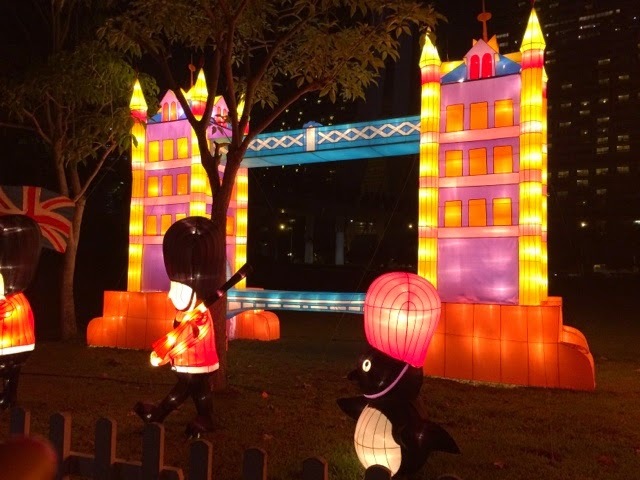 Many of the entries had a strong Singaporean theme taking recognisable aspects of local culture and focusing on promoting racial harmony and cohesion in the community. I was seriously impressed by the talent exhibited here! No festival would be complete without food, of course, and the gardens has an Asian food street selling a variety of goodies from China, Taiwan and Singapore. Although I didn't sample anything on offer on my visit (having enjoyed some dim sum before walking around the gardens) I did notice the presence of smelly tofu or rather the aroma of it. 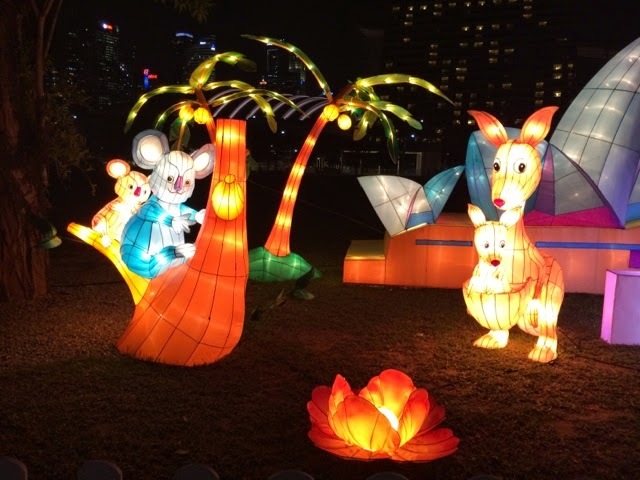 The Mid-Autumn festival is on now until 14 September 2014, Monday - Friday 6pm - 11pm, Saturday - Sunday 3pm - 11pm. Free admission, entrance fees apply to the cooled conservatories. 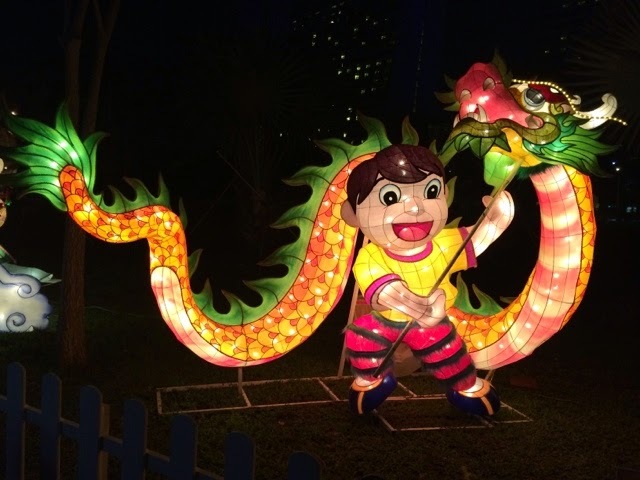 Check Gardens by the Bay website here for further details regarding the Mid-Autumn festival. Thank you to Gardens by the Bay for the kind invitation.